This elegant and stylish 9ct white gold total quarter carat diamond multi stone ring is designed to dazzle. 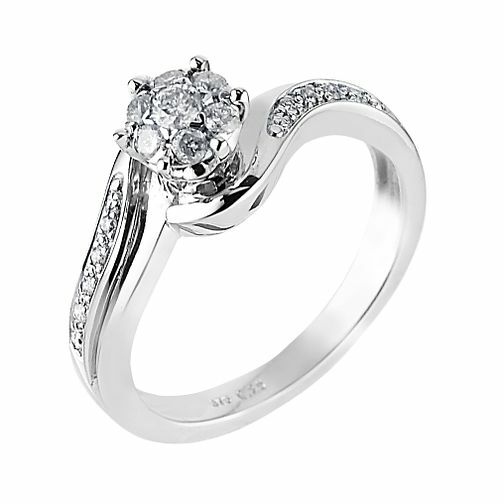 A truly breathtaking ring that is perfect for any occasion and will suit any look. 9ct White Gold Quarter Carat Diamond Cluster Ring is rated 4.1 out of 5 by 29. Rated 4 out of 5 by Anonymous from Lovely ring Love my ring that was picked out for me. Everyone compliments it all the time. I wear it daily and still look at it all the time after nearly 3 years of wearing it i love how it looks! The only fault is the rhodium has had to be done twice up to now to keep it looking white gold and fresh. I just wish H Samuel done a wedding band to match and fit hint hint. It's proving difficult to find a good fit without having a bespoke ring made. Rated 5 out of 5 by Anonymous from Engament ring This is the ring to have . An absoulutly stunning ring . Sparkly looks more expensive than it is . Nice size . All the ladies out there getting engaged you won't be disappointed with this ring. Gorgeous .